Terremoto was the first Spanish word I learned in Santiago de Chile. It means earthquake and could not be more fitting for the city. Santiago has been destroyed by earthquakes multiple times. In the whole city, only one building, a church, has never collapsed in a natural disaster. 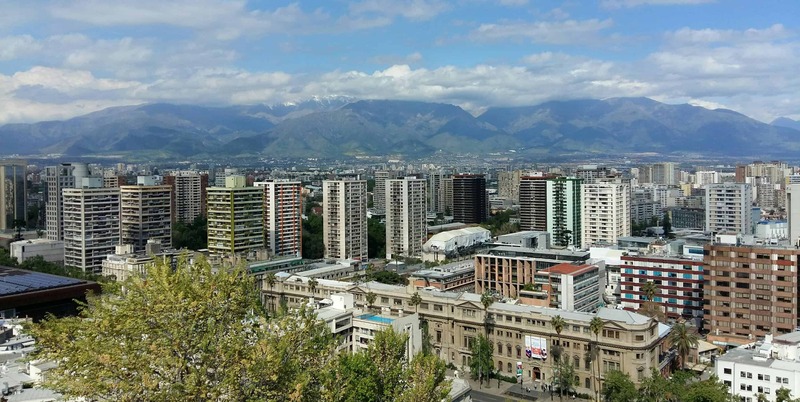 And since earthquakes are a part of Chilean history, it fits that the local drink you can find everywhere in Santiago is called terremoto – if you stand up after drinking one, the ground will shake like in an earthquake. During your visit to Santiago, the strong cocktail is most likely the only terremoto you will encounter. And besides hitting the local bars, there is lots more to do in this interesting city. If you have a few days here, I have a few suggestions for you on what to do and see. Walking tours are a great way to get to know a city. The one we did leaves from Plaza de Armas in front of the cathedral at 10am and 3pm every day. It is a free walking tour based on tips, so you only give as much as you think the tour was worth and as much as you can afford. Our guide was great, telling us interesting stories about Santiago along the way while showing us the most important sights and neighbourhoods. He also provided us with lots of advise on what to do, see and eat in this city. The Cerro San Cristobal is a hill located north of the city center. You have a choice between walking up or taking the funicular. From its top, you have a great view of Santiago and the Andes in the background. The area on top of the hill is huge and offers many hiking opportunities, right in the middle of the city. You can even take a cable car to the neighbouring peak, if you want to properly explore the Cerro San Cristobal. La Chascona, Pablo Neruda’s house, is located just below Cerro San Cristobal. From here, the Chilean poet had a great view of the Andes. Pablo Neruda built the house for his lover Matilda. It wasn’t until he officially ended his marriage that he moved in with her. The house was heavily damaged after Neruda’s death in 1973, but Matilda rebuilt it and these days, it is open for everyone to visit. An audioguide will explain to you about the strange layout and give you not only information about the poet himself but also about recent Chilean history. The Mercado Central is Santiago’s fish market. You can buy fresh fish here, but it is also a great place if you’re looking for a fish restaurant for lunch. They are located both inside and around the market and most offer great value meals. If you don’t eat fish, there is a good empanada restaurant located at the corner. The Museo de Arte Precolombino, located close to the Plaza de Armas, houses a great collection of indigenous art. It covers most areas of South and Central America on its upper floor, while the basement is dedicated to the Mapuches, the people that used to live in and south of Santiago before the Spaniards arrived. In total, the exhibitions come from about 100 different tribes. 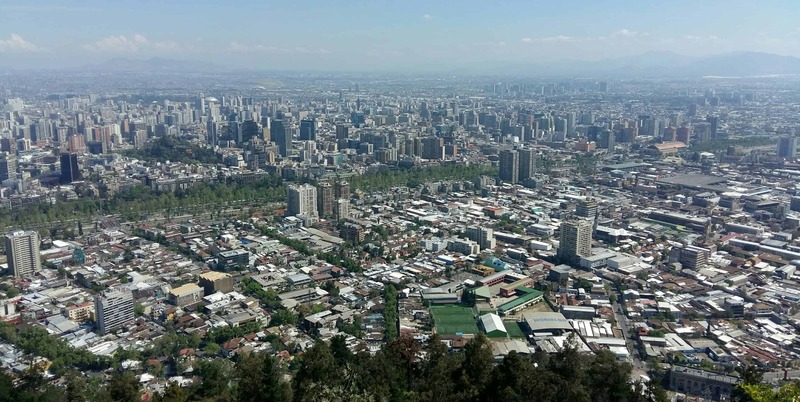 The Cerro Santa Lucia is a hill located in the middle of Santiago. It is 69m high and the remnant of a volcano that has been almost completely eroded. From its top, you have a great view of the city. It is not as high as the Cerro San Cristobal but more accessible and easier to climb. If the weather is good, you can sit down in the sun on one of the lower terraces and enjoy the view of the Andes. You can’t travel to Chile without trying their typical drink, the terremoto. It is made of a sweet fermented wine and pineapple ice-cream and served in bars all over the city. The best place to get one is the Barrio Bellavista, where you can find bars lined up next to each other. The drink is so sweet, you will barely taste the alcohol – but you will feel it the moment you try to stand up. 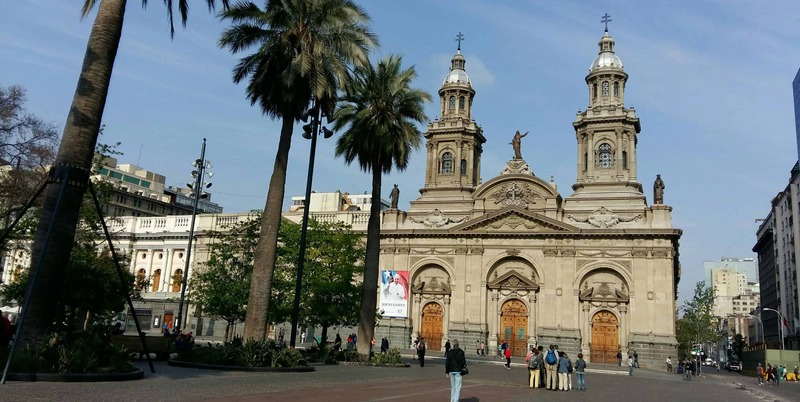 Santiago’s Cathedral, located at the Plaza de Armas, has been destroyed many times by earthquakes. The current version you see dates from 1800. The decorations inside are not as elaborate as in other churches, but the building is still worth going into for a quick look around. 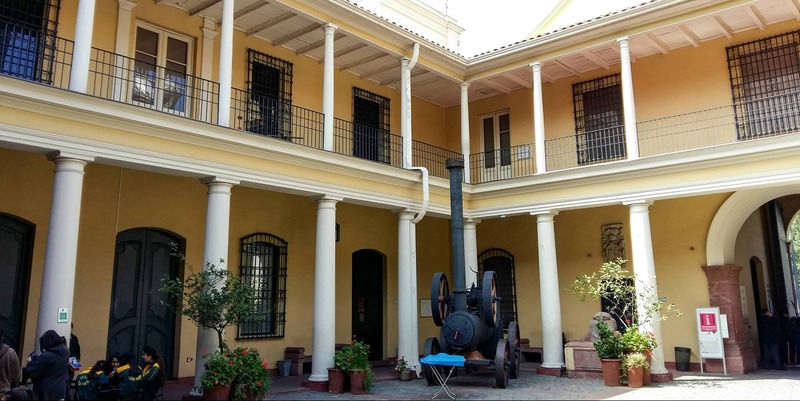 The National History Museum is located in a beautiful building from the early 19th century at the Plaza de Armas. Its exhibitions cover the time span from pre-columbian Chile to the military regime in the 70s. Many exhibits illustrate the history of the country. Unfortunately, signs are in Spanish only. But since the entrance is free, even if you don’t speak Spanish, it is still worth taking a look at. Many of the exhibits, from clothes worn more than one hundred years ago to pictures of the military coup in 1973, do not need an explanation to make sense. Located on the river’s southbank, the Parque Forestal offers a break from the otherwise grey and dirty city. Even though it is located next to a busy street, you barely hear the cars when walking in the shade of trees. While exploring the park, watch out for several things. First, you can find a couple of gifts given to Chile by other countries, like the German fountain or the head of Abraham Lincoln. Second, if you look closely, you will see dog houses. These were built by people living in the neighbourhood, to provide shelter for stray dogs. Pretty cool, isn’t it?